YaYaYa: Frederic Jameson, ‘End of Art’ or ‘End of History’? 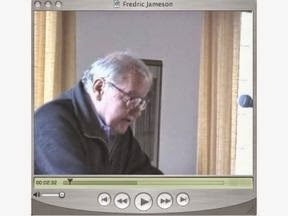 Frederic Jameson, ‘End of Art’ or ‘End of History’? I am at my parents’ house in New Jersey. I am spending time with my family. I don’t have enough time to blog today so I am posting an essay by Frederic Jameson, which I remember liking. It is called ‘End of Art’ or ‘End of History’? It’s a part of a collection of his essays called The Cultural Turn: Selected Writings on the Postmodern 1983-1998 (Verso, London 1998). I am reading things like this a lot and other things that are not like this. Maybe this is something that will be of interest to some of you. The format is left from the copy paste which might look weird but it might make it easier to read on smartphones in this format. I’m not sure. If it is not, sorry. There are some copy glitches too, sorry. Enjoy, talk to you next week. Spend time with your families if you like them. 'End of Art' or 'End of History' ? the sixties, now some thirty years ago, it is strange to think. may not be as old-fashioned as people used to say and think. little ahead of ourselves here. discussed by everyone from Marcuse to the Sunday supplements. fact, or art and life. the markedly right-wing spirit of the current 'end of history' . the empty mind of the world. symbolic, the classical and the romantic . . . towards what? beyond what thought can reach. fading and luminous categories of abstraction itself. conception of the figural and figuration as such. self of Western philosophy and capitalist industrial production. achieved philosophy has been reached. and claims posed by the dialectic itself. obsolete, lives on because the moment to realise it was missed'. of the negative and the positive, itself seems suspended) . or embellish the lifeworld of a stage of realized philosophy. constitutive feature of that event, in fact a certain art ended. which it was left to the Sublime to supplant the merely Beautiful. conjectures and historical interpretations seem possible as well. Brecht to Barthes, or from Joyce to Eco, from Proust to Deleuze. make a place for praxis itself. signed and commodified Theory itself in its lavish feasts) . - on the vaster scale of contemporary globalization. future as well as of the possibilities of genuine change. coincided with a generalized and planetary ecological disaster. to measure the resistance of our imaginations to this possibility.